The Garland of Jewel Ornaments: The Stages of Meditating on the Bodhicharyavatara (Tib. བྱང་ཆུབ་སེམས་དཔའི་སྤྱོད་པ་ལ་འཇུག་པའི་སྒོམ་རིམ་རིན་ཆེན་རྒྱན་ཕྲེང་, Wyl. byang chub sems dpa'i spyod pa la 'jug pa'i sgom rim rin chen rgyan phreng) - a guide to meditating on the Bodhicharyavatara by Rongtön Sheja Kunrig. 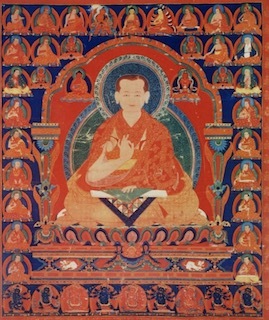 The Bodhicharyavatara can be practiced according to the ‘sequence of meditation’ as taught in the manuals written by Rongtönpa (Garland of Jewel Ornaments) and Patrul Rinpoche (The Brightly Shining Sun). Following these manuals, the Bodhicharyavatara is practiced in a particular order and is used as a text for ‘mind-training’. This page was last edited on 24 August 2018, at 18:44.